Swim, bike, run. Swim, bike, run. Swim, bike, run. Swim, bike run. It's all the talk at the backyard barbecue and the chatter in the gym locker room. Competing in one of the many triathlons around the world is the fitness marker of our times. It is kind of like what running marathons was during the 1990s. With triathlon clubs proliferating and the excitement of Olympic action on TV, competing in a triathlon has become trendy. Three BC members of the 'Class of 76' have been involved, and you can click on any of the photo thumbnails for a larger image. What does it take to compete? That depends on your goal. 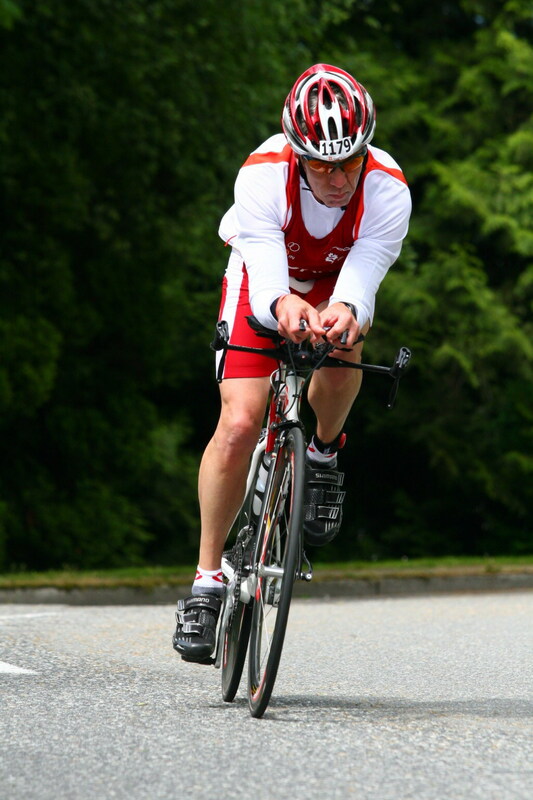 But for most beginners, the most popular triathlon is the sprint (750m swim, a 20 km bike, and a 5 km run). Those are attainable goals for people looking to stay in shape and have fun competing. 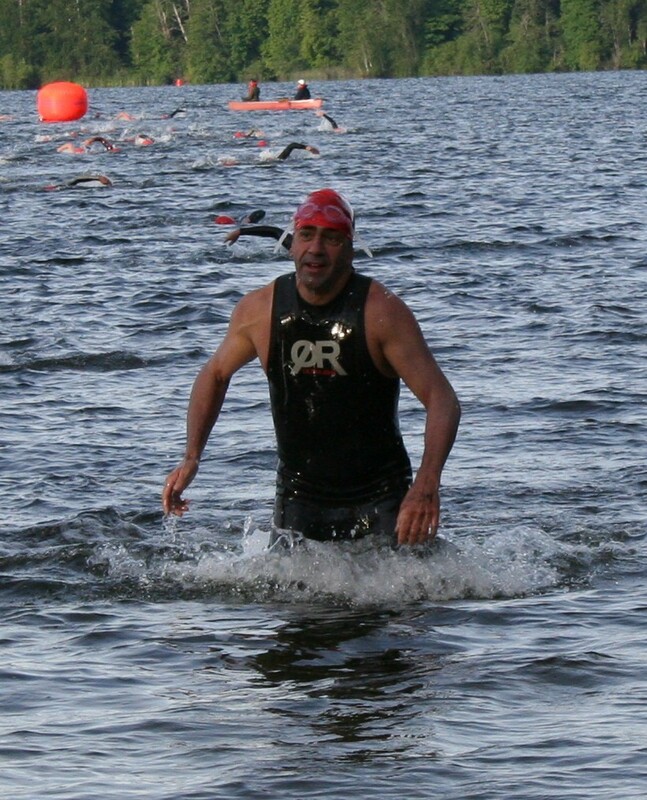 The next level in the Olympic distance (1500m swim, a 40 km bike, and a 10 km run. 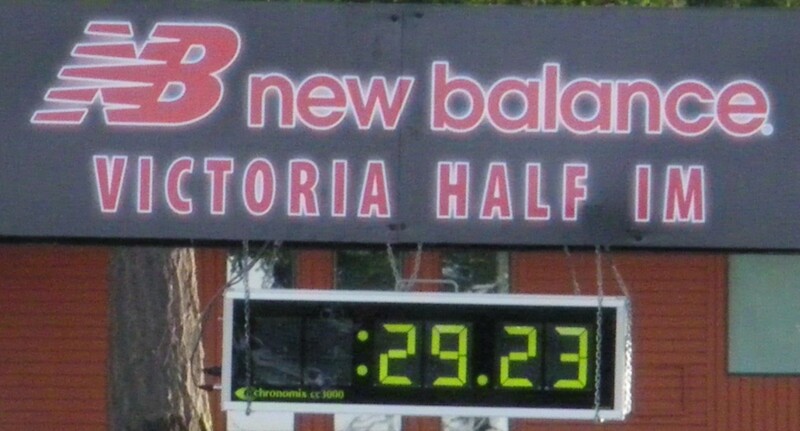 That is the distance that Bob and Don competed at in the World Age Group Championships in Vancouver in early June 2008. After the Olympic distance is the Half Ironman race (1900m swim, a 90 km bike, and a 21 km run). 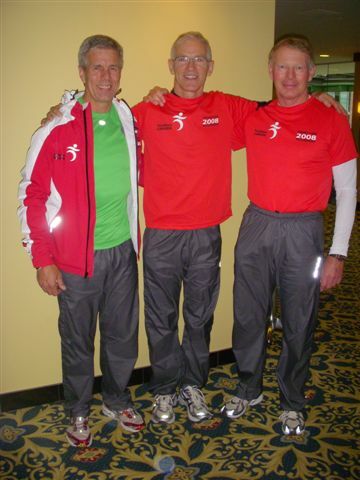 Don participated in two of these in 2008 (Oliver and Osoyoos), and John competed in the New Balance Half Iron in Victoria. Bob participated in this race as a member of a 3-person relay. 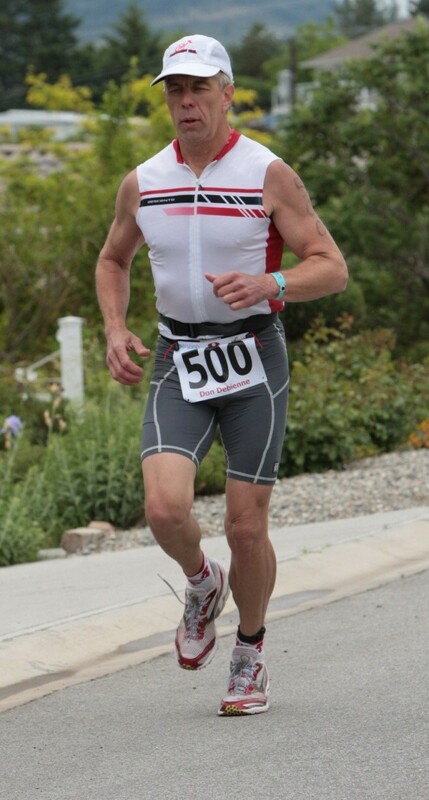 The longest distance Tri is the full Ironman (3800m swim, a 180 km bike, and a 42 km run) and Bob is training for the Ironman Canada race in Penticton. While longer triathlons are more about endurance, as well as getting enough water and nutrition while competing, even the shorter races require intense stamina. Core work, such as Pilates, is great for strengthening the back and abdominal muscles needed for competition. 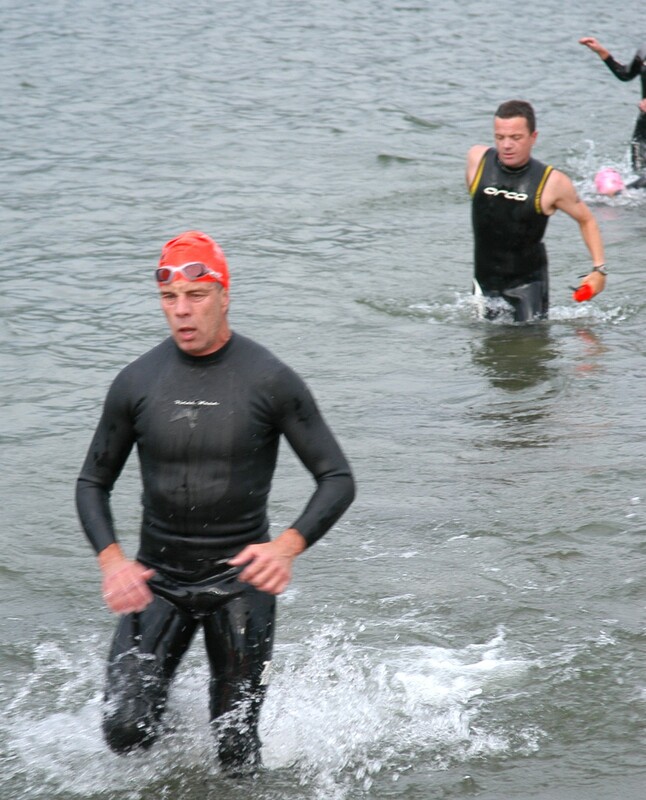 The open-ocean or lake swimming, though, is often the trickiest part of a triathlon. The open ocean swims can be frightening to those used to pools. 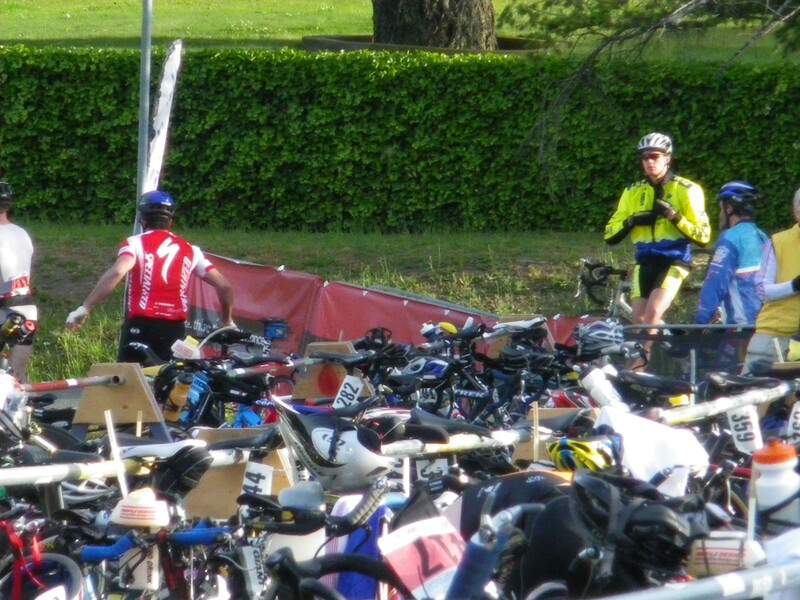 New triathletes can also be caught off-guard by the sheer number of contestants in a race. When several hundred people all start swimming at once, the more aggressive swimmers tend to swim over the slower ones. People are swimming on your back and pushing you down. Under such conditions, triathlon veterans say that you should keep calm and either tread water or do a little breaststroke until the crowd clears. A proper fitting wet suit is a must, and adds buoyancy as well as warmth in the cold ocean or lake water. If you're wearing a wet suit, getting out of it and into your biking stuff takes time. Transition from swim to bike to swim (T1) can cost significant time and energy. You can't wait until the race to practice this transition. The transition from the bike to run (T2) can be another rough transition for athletes. Choosing the proper gear is also important. The right bicycle has a light frame and features like aerobars to rest hands and arms. For the run, light and comfortable running shoes are important. The results can be worth the training, sweat, and discipline required. The very first time you complete a triathlon, the adrenaline flows hard and it can be an emotional high. To set the scene for my first Half Iron Tri, we have to go back a few years. When I was posted to Monterey CA in the early 80s, I got into this new sport called Triathlon. My first race was called "Wildflower" in a small man-made lake called Lake San Antonio and I was in the water with all the guys who were 'names' in the sport. I remember Dave Scott, Mark Allen, Scott Tinley, the Molina brothers - Scott and Phil - and others who I had seen on TV on "Wide World of Sports". I swam with these guys, but that is where the race ended for me. Later in the 80s, I did a few military races and short triathlons around Halifax, but nothing long. My first and only long race was the '91 CF Championships held in Kingston ON where you qualified if you had a "top 20" performance in any race. 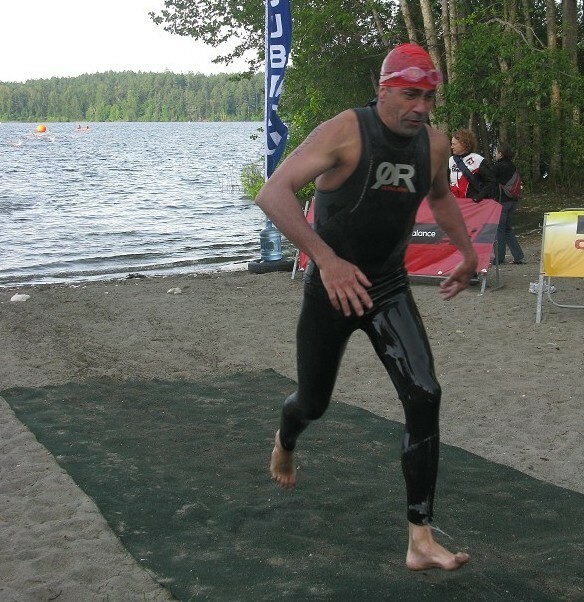 I had come 20th in the 1991 Citizen's Tri in Kearney Lake Halifax in a very short race (400 m swim, 9 km bike, and 3 km run). The K-Town Tri was 2000m swim, 55 km bike and 15 km run. I was doing lots of swimming, some biking and very little running. The longest that I had ever run in my life was a 10 km race. 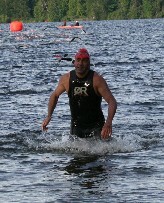 The swim went well, and I came out of the water with the pros. The bike was OK - a rolling course out past RMC to Gananoque but I was bagged at the end. 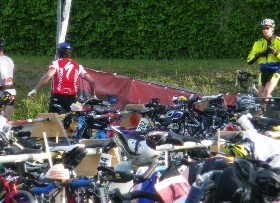 The pros were almost finished the run when I was finishing T2 and heading out on the run course. We started out King Street and out Bath Road past the prisons and came back through Queen's and down Princess Street. I hit the wall at 10 km and could hardly walk. I managed to jog the final stretch down Princess Street, but decided that I would never do this again until I had time to properly train for the run! Link to current K-Town maps - slightly different run now. I signed up for the June 08 New Balance Half Iron in August 07 and started dedicated training in November. I joined 2 biking groups, joined 2 running groups, and continued swimming 6 days a week. I was fortunate to get a good bike from Peter Reid - the actual bike that he used in October 03 to win Ironman Hawaii in Kona. When I started running, I could not complete 10 km without walking. By February 08, I was completing the 10 km run in under an hour. By the Victoria Times Colonist 10 km race in April, I had my 10 km in the 45 min range, and then I started extending the distance to 20 km. The first time that I completed 20 km in under 2 hours was in late April. At that point, I knew that I could complete the Half Iron without walking any portion of the run. My goals were realistic - 5:30 neglecting transitions - 30 min swim, 3:00 bike and 2:00 run. As you can see from the table below, I was within 1 minute of each one of those goals, so I felt a sense of accomplishment at the end. My plan was to relax the swim, save myself on the early portion of the bike, and use what was left on the run. I had a bit of an 'adrenaline rush' at the start of the swim, and was 7th of about 300 around the 800 m buoy. So much for a relaxing swim. Early in the bike when we had done a net uphill portion, I looked at my average speed and saw it was 31.8 km/hr. I was breathing too hard, and said to myself "slow down or you are going to die in the run"! Remembering very well what 'death in the run' felt like, I slowed my average pace down to about 29.5 and just enjoyed the North Saanich scenery! Even after doing this, I still struggled in the final 10 km of the run. My first 10 km was 56 mins and I felt great. The photo to the right was taken after the 1st loop, and I was just receiving support from Bob and Carolyn who told me that I was looking great! The final 10 km was 1:04 - even with a good sprint for the final 2 kms at the end. I have already signed up for the New Balance Half Iron in June 2009, and my major goal is to try to improve the final portion of my run. Both Carolyn and I have been competing in triathlons for 9 years. Carolyn loved the sport so much she left her legal secretary job of 25 years and became a nationally certified triathlon coach. We both run the triathlon club at the local YMCA. * April 2007 - Blazeman died from ALS. I encourage Ex-Cadets to check out my website and give generously to the War on ALS http://www.active.com/donate/teamblazeman/BGebbie. 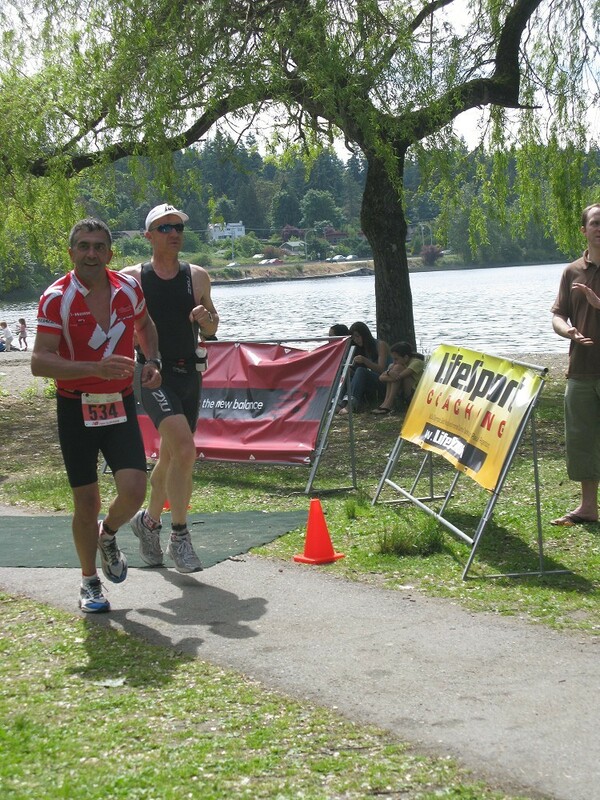 Several Ex-Cadets participated as part of the Canadian Age Group Team at the World Triathlon Championships in Vancouver 5-8 Jun 08. None of our results were as impressive as Capt Fawcett's inspiring performance, but we were there "tri-ing" for Canada. The attached photo is of 11061 Don Debienne, 11075 Bob Gebbie, and 6633 Jack Harris. 12186 Tom Keogh was also competing and 4670 Mike Ellis was there in an official capacity. If any other Ex-Cadets competed, I would like to hear from them. Next year the World Championships are in Gold Coast Australia - a warmer venue than Vancouver where temperatures were at 50 year lows. 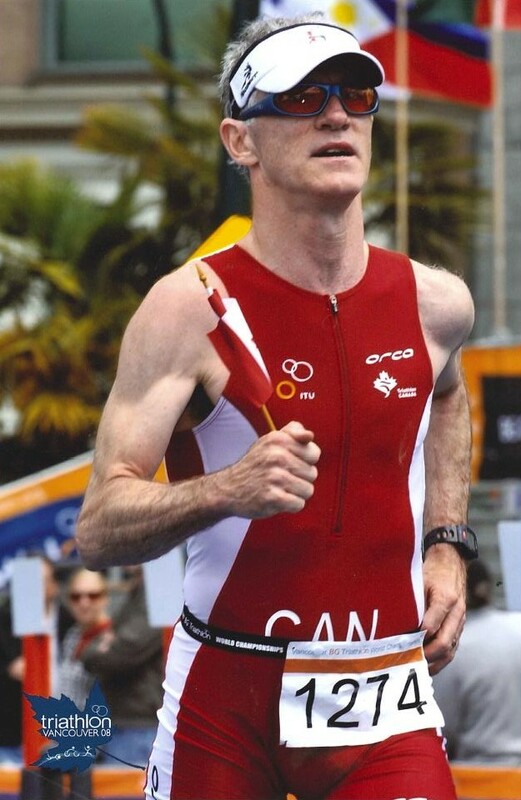 Bob Gebbie is doing two Ironman races this year. One of these 141 mile races in a year is a major accomplishment, doing two in one year is heroic.